Northcentral Chapter 8, a 501(C)3, is the Lycoming County chapter of the Society for Pennsylvania Archaeology, Inc., and we seek donations from your organization to continue our mission to promote, preserve and to protect Lycoming County's archaeological heritage. We have a long and illustrious history in the region, and have contributed greatly to the understanding of the area's prehistory and history. In fact, NCC8 is responsible for Canfield Island being listed on the National Register of Historic Places, in recognition of the amount of information it had yielded and because of its potential to yield even more information. The site is today part of Riverfront Park, a Loyalsock Township park that includes an archaeology-themed trail on the island. Since 2003, local Native Americans have held an annual pow-wow on the island. The chapter’s first meeting was held Aug. 12, 1955, at the James V. Brown Library in Williamsport. Since that time, NCC8 members have introduced archeology to generations, instilling the love of heritage and history. NCC8's monthly meetings are held at the Lycoming County Historical Society, 858 West Fourth Street, Williamsport, PA 17701, with the exception of the spring and summer, when chapter members are meeting on a weekly basis at our active archaeology site. 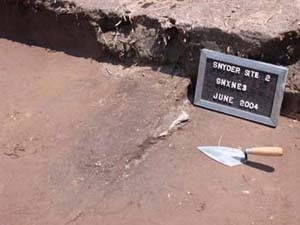 There, we introduce proper archaeological technique to our membership and to visitors, including Boy and Girl Scouts, Lycoming College Prep students, the community at large, and interested school field trips. NCC8 also works with Lycoming College, hosting its bi-annual Archaeology Field School. College students work alongside chapter members, in a unique learning environment. We've accommodated thousands of visitors throughout the years, putting a trowel in the hand of anyone interested in learning. This outreach requires equipment and infrastructure, as well as liability insurance. Your generous donation will ensure that thousands of more children and individuals can continue to join us at our archaeological excavations and learn to appreciate and protect our cultural heritage. We're asking you to support our work, and as an official non-profit organization, we're able to provide you with a tax deductible receipt for your donation.